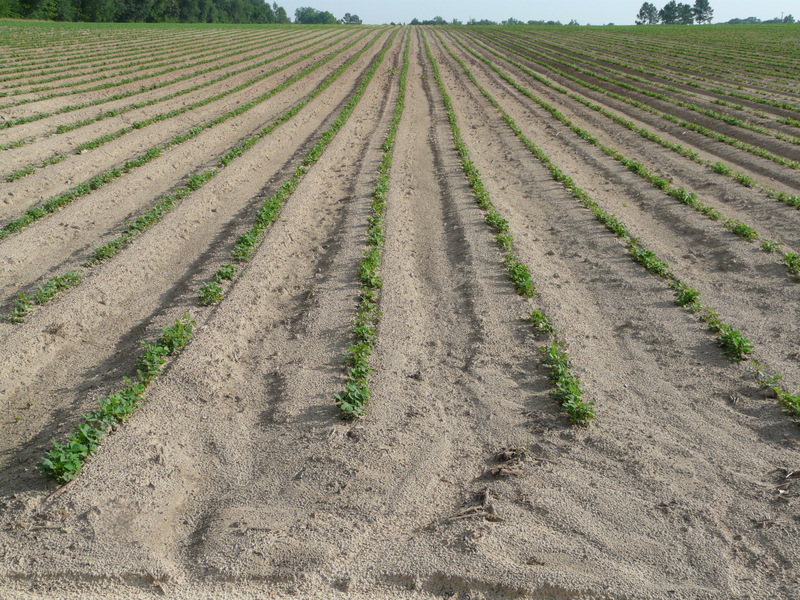 Here are some peanuts in the county coming along and look good. Here are some peanuts with burn from soil insecticide, thimet, put out at planting. Thimet moves systemically through the plant to help protect from thrips. 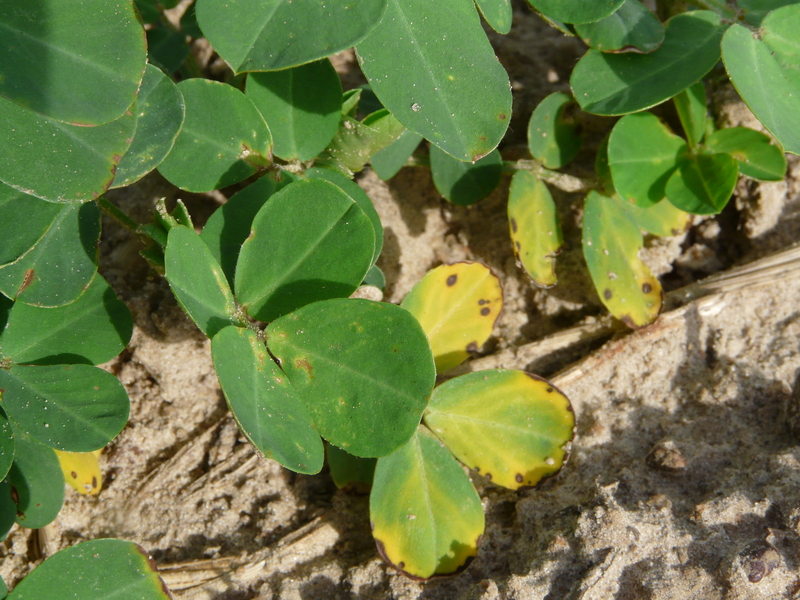 There will some yellowish burn on the outside of the leaves and spots will also be on the outside of the leaves. This burn isn’t that bad and plants will grow out of it with no problems. There’s not as much wheat planted this year. Some combines are harvesting the field edges and checking moisture. Here is some combines harvesting in the Northwest part of Thomas County. Brooks County Ag Agent, Garvie Nichols, said same thing over there. If weather allows, we’ll see more harvesting next week. We can see quite a bit of Fusarium in the grain heads as they were running the combines. The pathogen on infected heads will produce a mycotoxin which is often rejected above 2 ppm. Because of this, UGA Grain Agronomist, Dr. Dewey Lee, encourages blowing as much air as possible to take out the lower test weight/shriveled grain. With good growing conditions last week, corn is really starting to grow. This corn was having some nutrient issues up until last week. We had some much needed rain over Memorial Day in the county. Much of that rain came with thunderstorms were we had between 2 and 3 inches in town. Weather was pretty rough on Sunday and we had some hail. Here is some corn damage. This corn was planted around March 25th and now is about V7 to V9 growth stage. Much of this field corn is tasseling and silking and producing ears. We are also seeing some herbicide drift and does look unsightly. Drift on these plants was a little pronounced, but it would not cause us any problems. We need to be on the look out for stink bugs in corn. We saw a few stink bugs in the field yesterday. Pictured above is a southern green stink bug nymph. Corn is most sensitive to stinkbug damage during ear formation before silking. UGA Grain Entomologist, Dr. David Buntin, says treat when 25% of plants in ear zone are infested. Here is a link to the 2014 UGA Corn Production Guide which lists treatment options. Keep in mind, pyrethroids are less effective on brown stink bugs than southern and green stink bugs. Another insect we’re seeing is leafminers. The leafminer is the larva of a small black fly. Female flies lay eggs on the leaf surface that hatch into tiny larvae. If you look close through the transparent “window” of the leaf mine, you can sometimes find the yellowish maggots. They do not cause any economic damage and usually see them on the lower leaves. We’ve seen a number of diseases this Spring in our lawns. Large patch is the most common disease I find in Centipede and St. Augustine. Last week, Mitchell County Ag Agent, Andy Shirley, found Pythium in Bermudagrass. This week, I was asked to look at another lawn and came across another common disease we see called Fairy Rings (below). Fairy ring symptoms follow its description well, leaving large rings in the grass. Basidiomycetes of more than 40 species can cause fairy rings. All warm season grasses are susceptible, but it particularly attacks centipede and St. Augustine grass in South Georgia. Sometimes, above ground-mushrooms and puff ball basidiocarps are present. Other casual agents have rings but no fruiting bodies. Avoid using root zone mixes with high levels of undecomposed organic materials. Reduce thatch by vertical cutting. Use nitrogen fertilizer to mask symptoms on some types of fairy ring. Use soil wetting agents to help penetrate hydrophobic areas. No residential fungicides are available to control the disease, but some commercial fungicides can be found. Consult the current Georgia Pest Management Handbook. We looked at a few fields yesterday that may need to be replanted and we still have some time. Seed was planted two weeks ago from today and had a very skippy stand. First, we tried to determine what caused the problem and we looked at seed. There was not a problem with germination, but with emergence. Seed was planted a little deep and maybe impacted by rains and seedlings didn’t make it out of the soil. They also had to break up the crust a few times and likely some dirt further buried seedlings. The first thing we thought about was planting date. If the field was planted just a few days back, we would give it some time. The second thing is check how many three foot skips we have (also counting 6, 9, etc foot skips). If 50% of the field has 3 foot skips, we want to replant. This determination at best is subjective, but walk as much of the field as possible checking many rows. Sometimes, it maybe beneficial to replant spots. Since maturity in any field can be as much as two week difference, this could be okay. In the case yesterday, we’ll replant the whole field.